This April, May, and now June I’m sewing along with Sherry at Pattern~Scissors~Cloth. A bunch of other talented seamsters and I are all making coats following the construction methods used in ready-to-wear tailoring. Mine is a Burberry-inspired trench coat, and this post marks its completion. Finally. The end of the Sew-Alongs is here. After a stressful afternoon (To paraphrase: a cyclist ran into the side of my car while I was stopped at a red light and then carried on their merry way, no apology or concern at all. Had they stopped, I think my focus would have been on them – were they okay? But, they kept biking, essentially making it a hit and run while I was in the car. When confronted, they told me it was my fault because my window was in their way – which doesn’t make any sense and just confirms that they were CRAZY. I was pretty shaken up.) I came home and wanted nothing more than to get lost in some sort of relaxing, meditative activity. So, I tackled the last four of the buttons on my trench coat. I was headed to a friend’s “White” party, which is why I’m all dolled up. My husband was gracious enough to drive us there since I wasn’t about to get behind the wheel of a car again yesterday. After a long day it was fun to get to show off yet another completed, handmade item to my friends. Fantastic coat – sorry to hear about the bike incident! Actually, more than fantastic – that’s ONE AWESOME COAT!! Thanks! That means a lot coming from the woman who made such a fabulous Sara jacket for the same Sew-Along. Amy, it’s beautiful! I’m just getting around to checking blogs after a break from blogland but it’s great to see this finished! 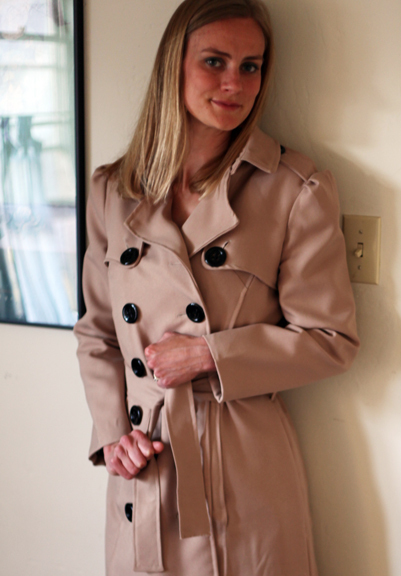 I love the big buttons and I always love when trench coats are hiding something elegant underneath. Such a cool contrast. And what’s up with “your window got in my way”? Thanks! Your white coat is fabulous as well. It’s too bad the cleaners pressed it funny, but it still looked great on you. Wow this is an amazing coat. So professional! Amazing!!! No one would ask you this question if it’s ‘handmade’? when they see this coat. 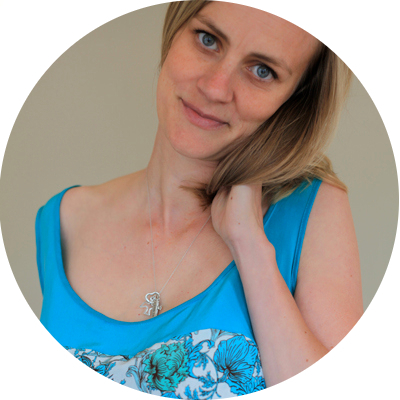 I just found your blog today and thoroughly enjoying your sewing creations. Your coat is wonderful. You are an excellent crafts person. Pam Cortese at mysewvacplace.com in Santa Rosa teaches a How to Sew a Trench Coat class and the students always have a lot of fun with that one. Woaw ! This is really impressive. thanks and again, congratulations, you must be so proud!!! beautiful coat! that would have costed over $100 in stores. Did you make the dress too? You should! I have enough of this fabric left over to hopefully make another coat as well! Have you seen the one on Miss Celie’s Pants? I hadn’t until now but that’s the exact fabric I have red on one side.